Many people email me with questions about a praying mantis they have found in their garden, patio, shed or in their house. A wild praying mantis has found its way into the house through an open window or door and decided it’s a good place to stay. A mantis can survive pretty well inside the house if there are enough flies or other bugs to eat. If not, you can better release it back outside to the garden or a park. But what if you want to keep your praying mantis as a pet? 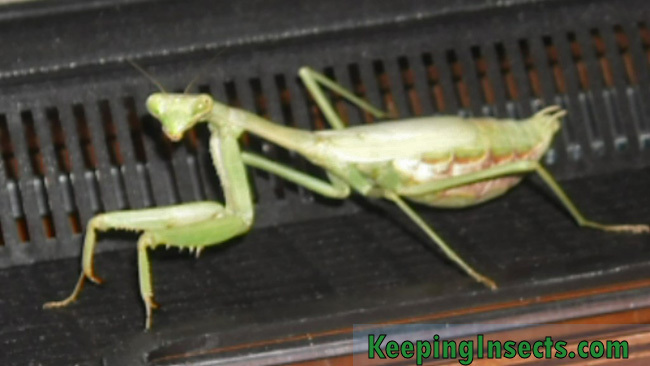 Especially when the temperatures start to drop it can be better for the mantis to live as a pet than to stay outside. The natural way of live for a mantis in countries like the USA or Europe is to die in fall when the temperatures drop and prey becomes scarce. As a pet, with enough food, a nice temperature and proper care a praying mantis can live well into winter. To get you started I collected some interesting articles that I wrote for you. 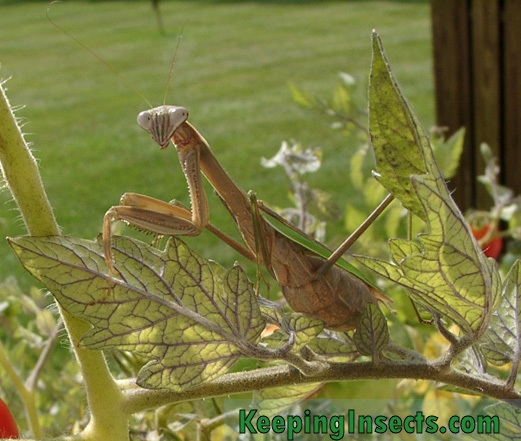 Tips on setting up their housing, feeding, providing water and making sure the temperature is OK.
A praying mantis only eats live insects as food. You can collect them in nature or buy them. Humidity is extremely imporant for a praying mantis. It needs water to drink but also needs air humidity to stay healthy. That are the basics for taking care of a mantis. Now your have found your mantis, you might also be curious if it is a he or a she. You can try to figure that out using our guide Male or Female Mantis? Then the species. There are so many mantis species, which one do you have? Or at least, if you cannot find the exact species, you would like to know what kind of mantis you have. I will try to help you out with showing the most common species in the USA. Is it an European Mantis? An European Mantis is green or brown, has a “classic mantis” shape and has some striking dots and colors on the inside of their front arms. An European Mantis can be found all over the USA thanks to being introduced there from Europe. It can also be found in the Southern and Eastern countries of Europe. Do you thing you have found an European Mantis? Check the European Mantis page out to know for sure. Is it a Carolina Mantis? A Carolina Mantis can be found all over the United States, not just the state of Carolina. It is a very common mantis in the USA and also occurs much further south, all the way to South America. A Carolina Mantis can be green or brown in color, the male is much smaller than the female. The female has wings that only reach to half its abdomen, making it look very different from other mantis species. Check out the Carolina Mantis page if you think you have found a Carolina Mantis. Is it a Chinese Mantis? 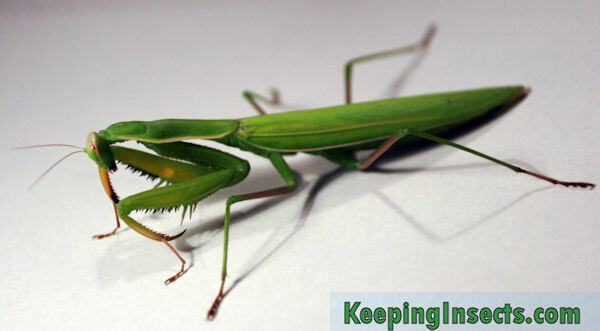 A Chinese Mantis is also pretty common in the United States because it was released there as a pest control agent. It can be green or brown in color and looks pretty similar to the European Mantis. 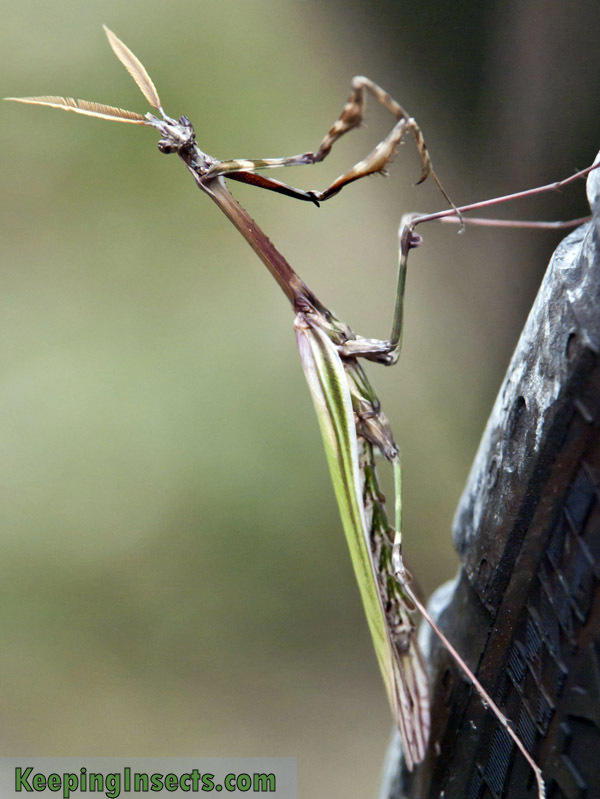 An imporant difference is that the Chinese Mantis does not have any coloring inside the front arms. It just has an uniform bland color without yellow, black or white spots. Do you think you have found a Chinese Mantis? Nice! Check out our Chinese Mantis page to know for sure. Is it an Unicorn Mantis? 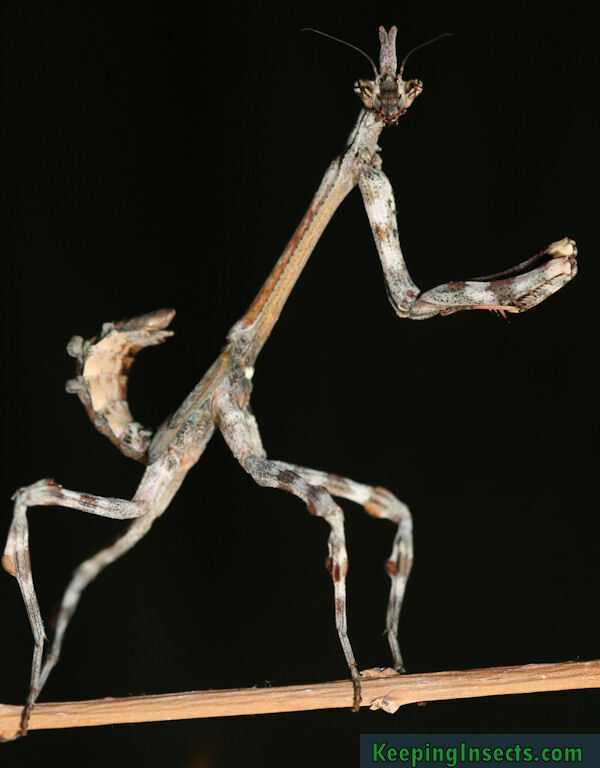 The Arizona Unicorn Mantis or Pseudovates arizonae is a very special mantis species that is not found easily. It occurs naturally in the United States and Canada but is most common in the state of Arizona. I will show you a picture, if you have seen it you will know for sure you have found an Arizona Unicorn Mantis. Which mantis species did I find? 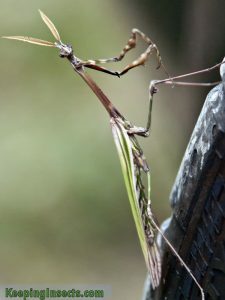 Cannot find the description of a mantis that looks like the one you found? Send me a message with picture! I will try to figure it out for you. 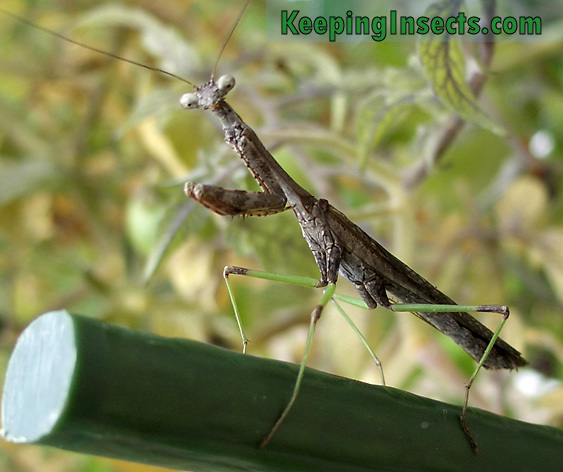 You can also check our Mantis Species page.